This nifty and comfortable tote basket is a perfect fit for shopping and going to the beach or to a picnic. This basket, woven out of natural Elephant grass is lightweight, but thanks to its goatskin handles also durable, holding heavier items, too. It looks elegant, and is therefore fitting to replace a purse on a summer concert or a beach trip. And should there be a moment when the basket does not have any other particular use, it is also perfect for storing magazines waiting to be read, or for hiding the hats and scarves that tend to pile up in the hallway. All in all, it is a truly multipurpose basket that has a place in every woman’s home! The basket is made of natural veta vera grass straw, handles are covered with goatskin. Avoid long-time use in humid conditions. Should the basket loose its shape, hydrate it lightly, and restore its initial form. Allow it to dry in a well-ventilated room. Colors may fade in contact with direct sunlight. Caution – this product may splinter! The Yen Pang Basket Weavers cooperation was established in 2014 in the Kongo village of northern Ghana, when Mondo offered the village women an opportunity to learn basket weaving. Having initially started off under a mango tree with eight women, the cooperation has now doubled in size, and has a small facility which was renovated with the help of Mondo. About half of the weavers are widowers, whose position in the society is low, and most of the women are illiterate. Weaving baskets offers them an important additional income after small farming. 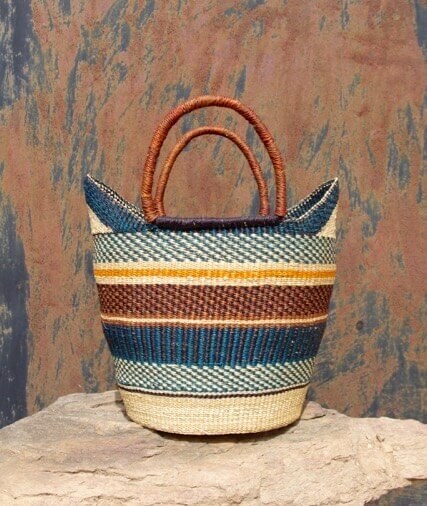 During fall 2014, Triin Kordemets was in the Kongo village as a volunteering designer, and a year later Anne-Liis Leht did the same, and their cooperation with the local artisans has led to the creation of the baskets being sold here.